The reference pane pops out from the right edge. A menu choice or a keyboard shortcut brings up the reference pane on the right side of the window. 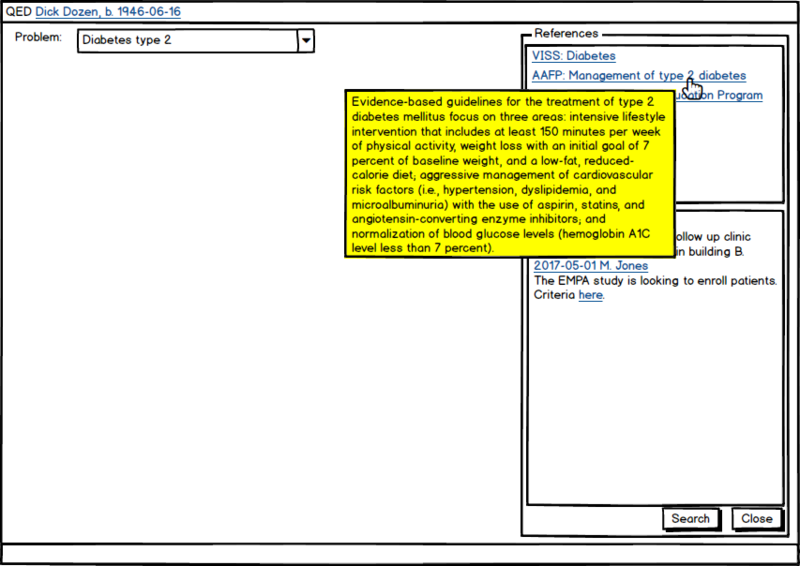 That pane has two parts: at the top you’ll find stored links from earlier searches that have been flagged as “useful” by yourself and/or other users in the context of the given problem (in this example “Diabetes type 2”). 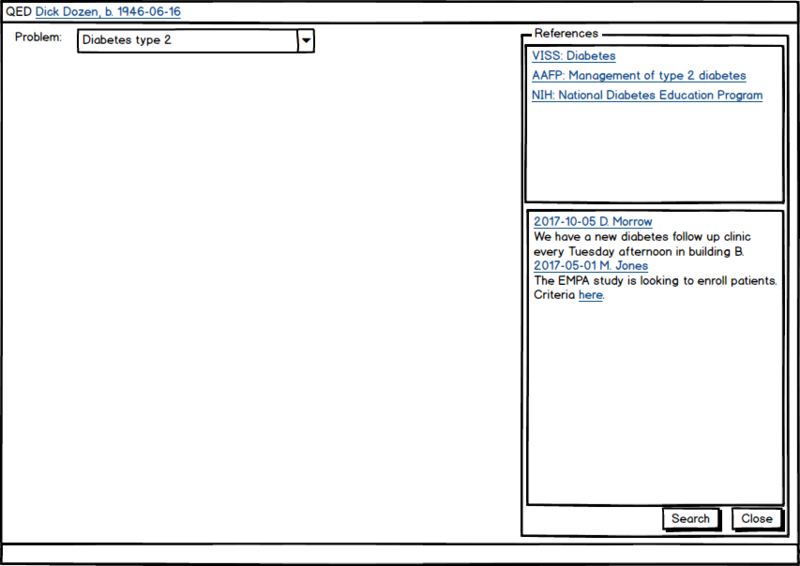 The lower part shows general notes entered into the system by other users or administrators, also depending on the type of problem chosen. Hovering the mouse over a link in the pane pops up a longer description. Hovering the mouse over a link pops up a longer description in the form of a tooltip. Clicking the link brings up the full document the link refers to. Searching, similar to search through a browser. 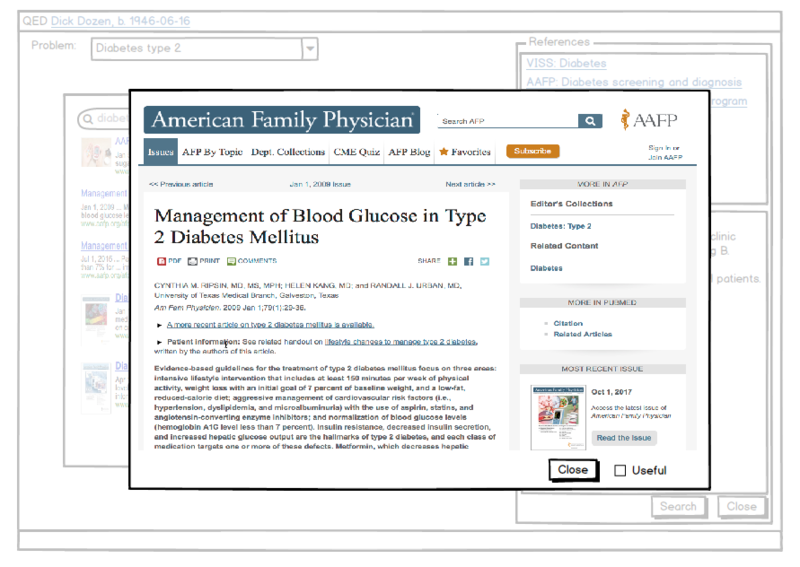 The “search” button opens a window where you can do a search similar to what you do through a browser, but with an important difference: the sites searched are limited to a preconfigured list of reliable sites, such as AAFP, Mayo Clinic, NLM, etc. Local repositories of guidelines can also be included, of course. Any found articles can be read right there. Selecting any of the found articles opens the linked document, just like in a browser, but there’s an important checkbox at the bottom right: “useful”. If the article is not yet in the original reference pane, in other words, it’s a “new find”, then the checkbox is unchecked by default. If the article was in the original list, it’s checked by default. This is done this way so that a careless user who simply skips thinking about that checkbox does minimal damage. If the article was not in the list, then the checkbox is cleared. If the user then checks the checkbox, the article will be added to the list for future reference. Else it will not be added to the list, of course. If the article was in the list, the checkbox is checked by default. If the user unchecks it, it’s a downvote. After a set number of downvotes, the article will be removed from the list1. 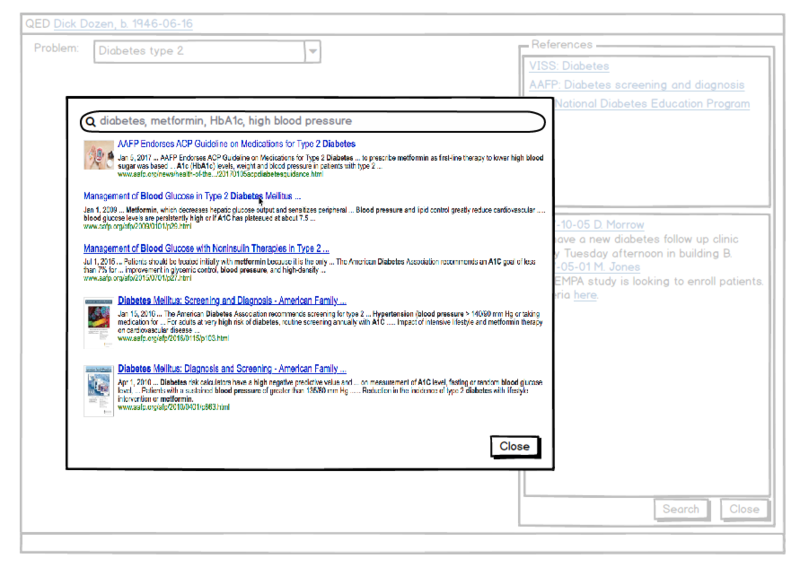 When saving a new reference, the short and long description is entered. 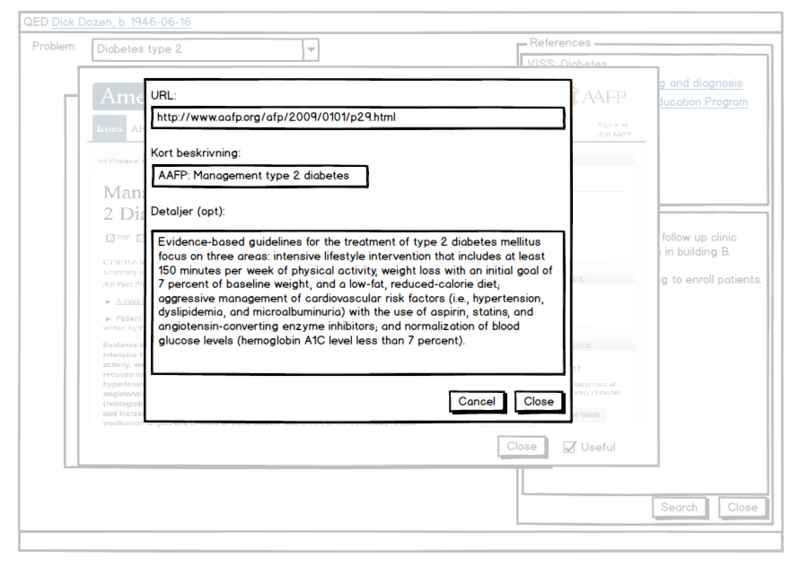 If an article is being added to the reference list for the first time, this dialog box allows the user to enter a short description that will be used in the reference pane, and a longer description that will be used for the tooltip. If the article was already in a reference pane but for another problem type, then those strings are used instead. Tests need to be done to find the optimal solution. Could be: immediate removal for this user, but only global removal if a set number of users deem it useless. There also needs to be a list somewhere of recently removed references, in case it is removed by mistake. Lots of variants are possible and some fine tuning will be necessary. As long as the UI remains simple.